Do the World’s Longest Geocache Trail- get started with this kit for your Outback Way adventure. Find the 35 treasure boxes along the way. Get amongst the world’s longest geocache trail, with your starter kit- providing you with the coordinates of the 35 cache’s hidden along the route- like little pots of treasure, use the included trinkets to put a trinket in as you take one out of the cache you find, make a note of where and what you found in the notebook, register your find online, enjoy the special places you will see on your treasure hunt on the Outback Way. 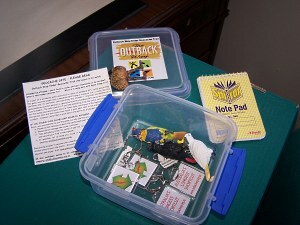 Do the World’s Longest Treasure Hunt- Geocache Trail- get started with this kit for your Outback Way adventure. Find the 35 treasure boxes along the way. Find some treasure on the Outback Way, with your starter kit- providing you with the coordinates of the 35 cache’s hidden along the route- like little pots of treasure, use the included trinket to put a trinket in as you take one out of the cache you find, make a note of where and what you found in the notebook, register your find online, enjoy the special places you will see on your treasure hunt along the Outback Way.